I chose to read this book as part of a challenge - I had to read a book by a debut author. I looked at the Goodreads list for 2013 debut authors and this was the only one which really jumped out at me - perhaps because I really liked the cover! 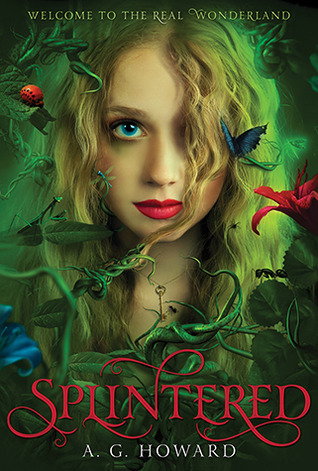 Prior to seeing the list of debut authors and their books, I hadn't heard of Splintered so I had no expectations of what it would be like. Obviously, I read the synopsis of the book and saw that it was a retelling of Alice in Wonderland, but other than that, I wasn't sure what it was going to be like. I'm so pleased I chose this one as I was fully engaged straight away. I thought the world building was great and the characters were great too. I really liked Alyssa, the main character, whose perspective the book is told from. She was very quirky, keeping electric eels and trapping and killing bugs for her art to name but a few. Later in the book we find out why she focuses on those things in particular. I also liked the focus on mental health and the happenings in the psychiatric hospital in which her mother Alison was residing. It would seem that the women in the family, who all descend from Alice Liddell, the inspiration behind Lewis Carroll's Alice in Wonderland, have all in the past developed mental health problems of some kind and been institutionalised and Alyssa will do anything to stop that from happening to her. She already hears bugs and flowers talk so she is determined to get to the bottom of it even if it means entering Wonderland and throwing out the window what she thought was reality. Loved it! Towards the end, I got a little lost but I think that was just my attention waning as I was probably listening to it while doing something which perhaps required slightly more attention than just washing up! I listened to the audiobook and I thought the narrator was very good, although her attempt at an English "Cockney" accent had me smiling every time I heard it! I will definitely read the follow up book in the series at some point.